This is a new Pairs deck featuring art from Echo Chernik's Goddesses of Food series. The cards in the deck are simply the numbers 1 through 10, with amazing all-ages pinup art by Echo Chernik. 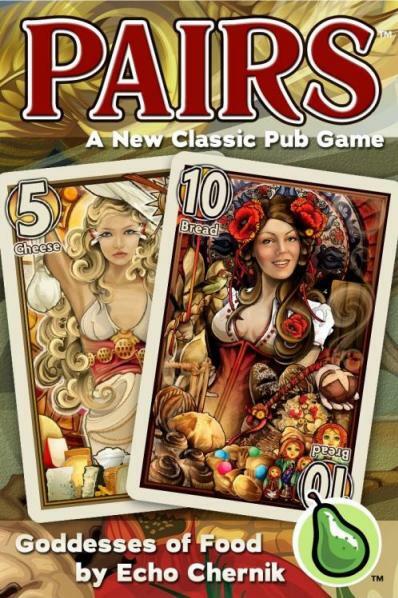 Pairs is a "New Classic Pub Game" introduced in the Fall of 2014. It's a simple card game with a basic triangle deck: Just 55 cards numbered 1 through 10, with 1x1 2x2, 3x3, and so on up to 10x10. In the basic game, players take turns drawing cards and trying not to score a pair. Or, you can fold, and score the lowest card in play. The first player to score too many points loses the game, and there's only one loser! The Goddesses of Food deck also contains the rules for a variant game. The rules are not yet final. Pairs is a quick-playing and original card game, and is coming in many versions with many different alternate rules.